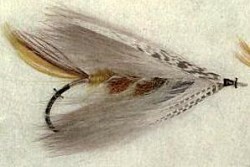 Wing : A pair of light, mottled grey Turkey tail strips (set flat). Body : Yellow, light blue, and scarlet seal's fur. Body : Black Mohair well picked out. Wings : Brown mottled Turkey strips.